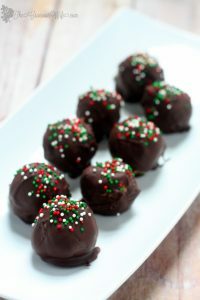 Peanut Butter Chocolate Truffles with creamy, salty peanut butter covered in decadent chocolate and festive sprinkles will be the hit at your Christmas party. I see so many truffles around the holidays! 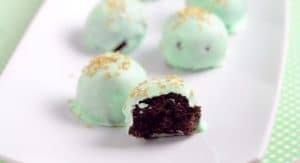 They are all so fantastic, I just had to try my hand at creating my own, which is where this Peanut Butter Chocolate Truffles idea came from. 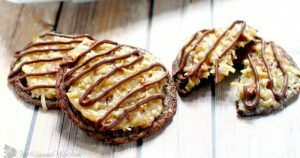 The concept was similar to peanut butter cups, only I added Ritz crackers to give it an extra salty savory kick. 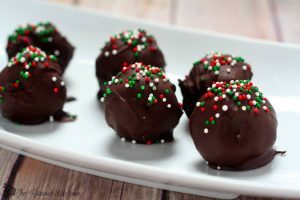 These Peanut Butter Chocolate Truffles came out delightfully, perfect for all peanut butter lovers! Place Ritz crackers in a food processor and process until they are fine crumbs. Add peanut butter and cream cheese and process again until everything is smooth and fully combined. Remove cracker mixture to a large mixing bowl and gently fold in Reese's cups. Using a tablespoon, scoop out peanut butter mixture and form into balls. Melt chocolate and shortening in a small bowl in the microwave for 30 second intervals, stirring between each interval, until chocolate is melted and smooth. 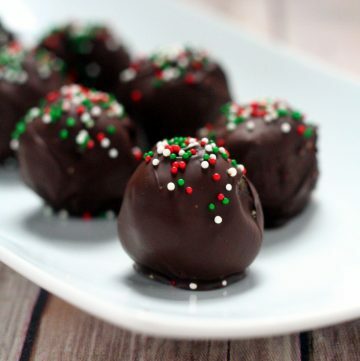 Dip each peanut butter ball in chocolate. Be sure to fully coat it, then place on a sheet of wax paper. 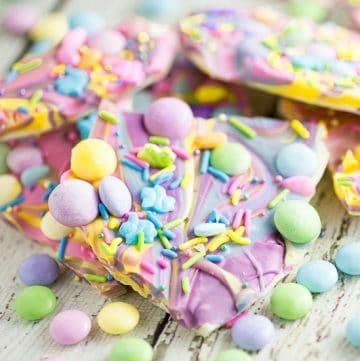 Top with sprinkles, if desired. 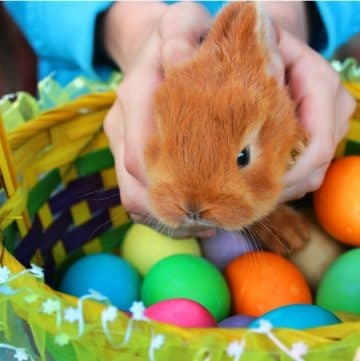 Allow chocolate to harden before serving. 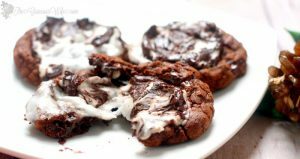 For more amazing Christmas Cookies Recipes, check out the rest of our recipes at our Week of Christmas Cookies main page. 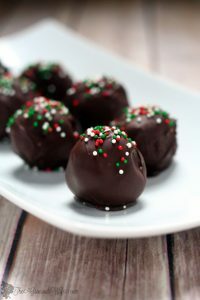 Did you like this Peanut Butter Chocolate Truffles recipe? 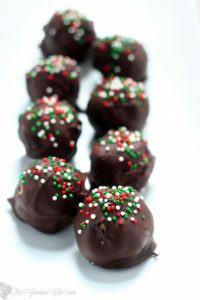 Find more on my Christmas Cookies, Christmas, and Cake Pops & Truffles boards on Pinterest! 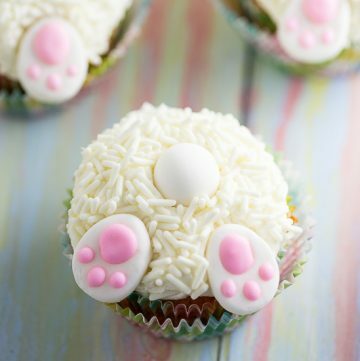 wow, these look amazingly yummy! And not too hard to make. I might try my hand at it! My son would love these! Thank you for linking up to Party Time and we hope to see you again next week! How many does this make? I’m guessing it makes quite a lot. I like that in a recipe. 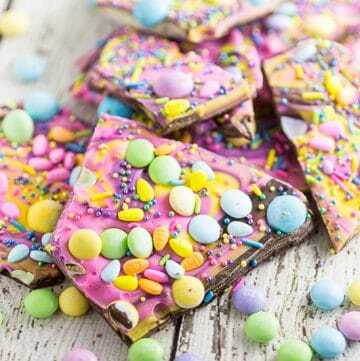 I might make them tonight, they sound amazing! This does make quite a lot. Probably around 3-4 dozen, depending on how big you roll the balls.